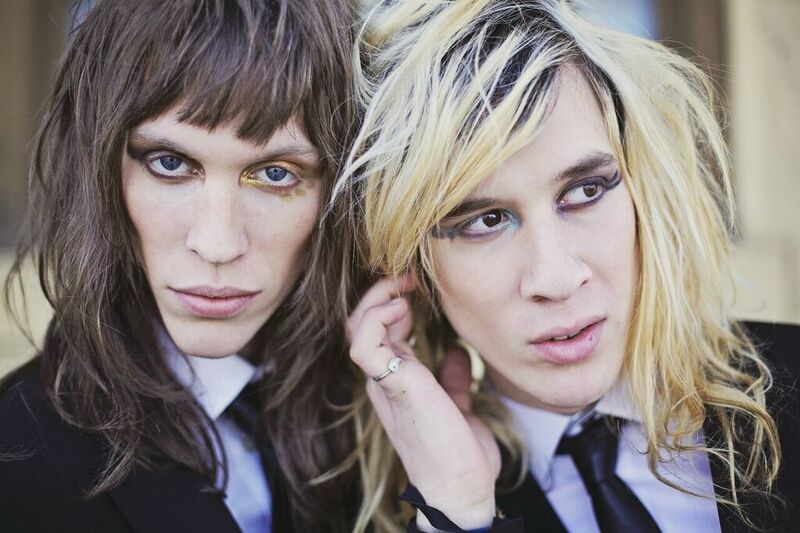 THE FAME RIOT is fashionable avant-garde, gender-fluid duo consisting of two fabulous, over the top brothers in their early 20s who live and breathe music and fashion. Raised by minister parents, the brothers were introduced to music from a spiritual perspective and being drawn to secular music, which they would listen to in secret, the two made the music that they longed to hear. Influenced by four decades of rock, pop, electronica, disco, and everything in-between, Liz Scarlett and Shazam “Tea Time” Watkins are what you would expect if you bottled up the fun and energy of raging summer parties, and threw in some flippant Hollywood glam. Thanks for your time! Now that 2016 is over, what are some words you would use to describe the year? What have been some of the highlights for you all the band’s music? What are you most excited about for 2017? Did either of you make any New Year’s Resolutions? Shazam: TUMULTUOUS. UPHEAVAL. COLOSSAL. The whole of 2016 was an insane journey full of hard work, sacrifice, passion, pain, and a seemingly endless series of triumphs. I am ravenous for 2017. I’m extremely excited to see where this year will take us. Goals are always being worked towards, but I find that I can never really predict exactly how those goals will be achieved. Liz: Of course! I’d use words like “purging, cleansing, conception, direction”. We signed our first ever record deal with Another Century, that year! Right next to that, I’d have to say that going out for our very first national tour had to be another huge highlight for us! I’m excited for all of the mysteries that are going to unfold, this year.. and for all of the new amazing people I’m going to meet! I don’t believe in New Year’s Resolutions! I believe in resolving your problems when you’re presented with them. If you truly desire change, you’ll change, no matter what day of the year it is. Growing up, did you both always want to be musicians? Can you recall some of your first musical memories? ​Shazam: ​Music was always a very spiritual part of our growing-up years. It was never interpreted as simply noise. Music has immense power and energy to change and transform our thinking, outlook, or decisions. Go to a gospel service and try not to be moved by the emotion and energy within the musicians and congregation. Its inspiring! I’m curious to know what it was like being raised by minister parents and then discovering all that secular music. How do you think that has influenced the kind of musicians that you are today? ​Shazam: ​My papa introduced me to Bill Withers and Pink Floyd and that pretty much started me on my musical journey. Still, music was a controlled item at home and that meant that any sort of music we were able to hear outside of our parent’s parameters was a treat. It has only inspired me to look deeper into music’s past, present, and future! ​Liz: ​Growing up, other kids had drugs, but we had music. It was one of those nonnegotiable subjects with our parents, where if we got caught listening to something that was ‘unapproved’, it’d be the end of our special privileges, and that was only the beginning of our punishments. So.. I think having a sacred respect for the ‘bad’ music made it more special to us than other kids. It wasn’t a given. It wasn’t accessible. I remember it feeling extremely special to hear secular music with my older brothers or with friends, whenever I was outside of that parental bubble. A DJ recently called your single “Heart Stray” one of the catchiest pop records he’s heard in years. What do you think it is about the song that draws on that? What was the inspiration for it? ​Shazam: ​Writing a good song doesn’t always mean you are trying your hardest. Sometimes the best things come out in a time of confusion, exhaustion, or just fiddling around on your instrument. I know that sleep and dreams had a lot to do with how that song came about​. Liz: ​I’ve always noticed that the best pop music is typically danceable music. Heart Stray was originally built on its rhythmic production and feel, with dance roots vibes. Our producer Rob Daiker played a huge role in helping us capture the right production needed to present the song in it’s best manner. I feel like everything we record is inspired by our love for pop music. The lyrical content is very much based on the reality of failed relationships and the pain of love lost. What was your first national tour like this past November and December? What were some of your favorite venues and crowds? Are you itching to get back on the road? ​Shazam: ​It was a dream come true! We were on the road as the direct support for a group called Radkey, who are based out of Missouri. Those guys just became like extended family. I’m really so honored to have met them and been in the trenches like that. I just cannot wait to go back out on the road. It’s calling my name, “SHAZAAAAM SHAZAAAAAM WHERE ARE YOU? ?” and I’m like “WAIT! JUST A BIT MORE SLEEP!” For real though, I want to tour again like right now. ​Liz: ​I’m SCRATCHING now too! (Laughter) It was amazing. By far, the most challenging experience of my life, but entirely worth every moment. The guys in Radkey are outstanding people and we made great friends in them. My personal favorite show was the one in NYC, at The Studio at Webster Hall. After that, Washington D.C., Los Angeles, and Chicago. All of those shows were HOT! ​You’ve performed alongside many incredible acts. What experiences really stand out to you both? ​Shazam: ​It is always an honor to share the stage with a great act, but every show I play is for the person that is there for the experience, who wants to share the positive memories, and who pay tons of money just to come out and support. I love opening for Mickey Avalon. It’s always a party. Wish that guy would just take us everywhere! ​Liz: ​My most recent favorite was when we opened for Mickey Avalon in our hometown, last year. The venue sold out and there was this undeniable energy and anticipation from the crowd, before we hit the stage. It was so special! ​Shazam: ​Everything Everything, James Blake, Anderson Paak, Snarky Puppy, MUTEMATH, Rufus Wainwright, Club of the Sons, ANYTHING Damon Albarn touches is gold. Caldwell, Wonder, Iggy Pop, Skrillix, Stanton Moore, etc. The list is endless. ​Liz: ​Michael Jackson, David Bowie, Freddie Mercury, David Byrne. I’d love to collaborate with people like Damon Albarn, Magnus Tingsek, Mayer Hawthorne, or Max Martin. ​Shazam: ​I hope that our music challenges their thinking in ways that they may not even like right off the bat. Any change of environment can be uncomfortable in the moment. Until you suddenly realize that you’ve grown and no longer want to go back to that old, embarrassed individual. So get out the sequins go spread some light into another person’s life! ​Shazam: ​I love to read. I will read just about anything. Graphic novels, manga, history, Harry Potter, LOTR, philosophy, and of course, the dictionary. I’m also quite into gaming, and anything in the Dark Souls franchise is unbeatable. Currently playing an emulated version of Final Fantasy 6 and it is a gem! ​Liz: ​I feel like I’m always in the studio.. (Laughter)! Even when I’m not recording music for THE FAME RIOT, I’m always creating or programming something. Creating art truly is my favorite thing to do. But when I’m not creating, I love being with good people. I love walking the streets, forests, beaches, listening to music and cooking wonderful food. ​Shazam: ​I am scantily clad while answering these interview questions and I hope that brought pleasant images to your mind’s eye! ​Liz: ​You can currently hear our single “Heart Stray” in various Hollister stores across the nation, also on Spotify, iTunes, Napster and Amazon! Be sure to follow us on our social networks: Instagram, Facebook, Twitter, and Snapchat.